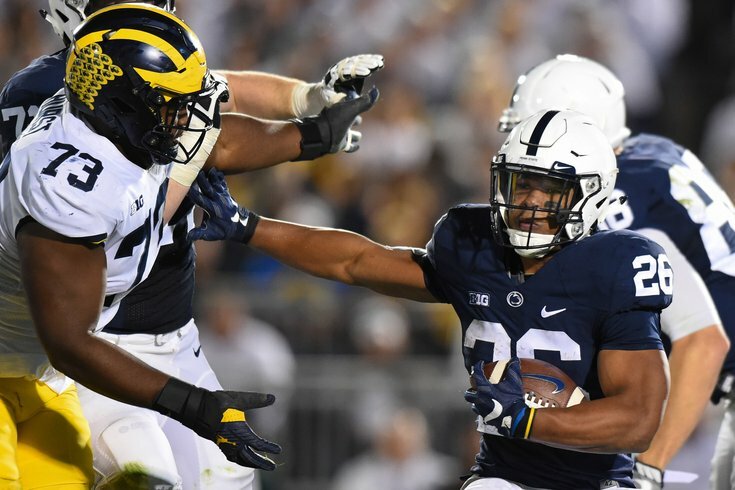 No, not Saquon Barkley. The other guy pictured above. Last offseason, we published our first Eagles only mock draft on January 3, oh and hey, look at who we had as the first round pick! This year, mock draft season had to wait a little longer for Eagles fans. I'm sure you've all survived without it. There's no earthly reason Hurst should be available at pick 32, but it has happened with undersized defensive tackles in the past. At 6'2, 280, Hurst is far from a prototypical defensive tackle. Geno Atkins fell all the way to the fourth round in 2010, and Aaron Donald to the 13th overall pick in 2014, despite being clearly more talented than many of the players taken before him. Has the NFL learned their lesson on that? If Hurst were to fall, he would be an outstanding fit along the Eagles' penetrating defensive scheme, even with Fletcher Cox and Timmy Jernigan already occupying a big chunk of the Eagles' salary cap. As we noted in our running backs "stay or go" post, Darren Sproles' time is Philly is likely over, and the Eagles could stand to upgrade from Kenjon Barner in the return game. In Pettis, they'd get one of the best punt returners ever to come out of college, as well as a dangerous receiver. As a receiver, Pettis' reception and yardage numbers aren't great, but he found the end zone 15 times in 2016. It will be interesting to see how the NFL values Pettis as a receiver. A year ago, North Carolina's Ryan Switzer, an elite returner in college and 1000-yard receiver lasted until the fourth round. Pettis would be great value there as well. Ballage also has odd receiving numbers. In 2016, he caught 44 passes for 469 yards and a TD, which is good. In 2017, he had 20 catches for only 91 yards (4.6 yards per catch!) and a long reception of 10 yards. Part of the reason for Ballage's low yards per carry and yards per catch numbers were because his offensive line stunk. From a tools perspective, however, he's big, he has impressive speed/athleticism, he runs hard, he's thought of as good in pass protection, and he can catch a little bit, so he should be of interest to the Eagles. Shaquem Griffin is the twin brother of Seahawks CB Shaquill Griffin, who had a good rookie season in the NFL. The Griffins have a cool backstory. Shaquill and Shaquem (who only has one hand) both enrolled at UCF, when Shaquill had offers from schools like Alabama, but the brothers were adamant that they were a package deal. Despite playing with one hand, Griffin finished the 2016 season with 92 tackles (20 for loss), 11.5 sacks, 7 pass breakups, 2 FFs, 2 FRs, and an INT. That is incredible. In 2017, Griffin had 74 tackles (13.5 for loss), 7 sacks, 3 pass breakups, 2 FFs, 2 FRs, and an INT. Some team is going to take a chance on this guy in the draft and be rewarded with a good player. Why not a team full of overachievers like the Eagles? On a side note, Griffin is a layup for Jason Kelce at next year's parade. "Lane Johnson can't stay off the juice; Shaquem Griffin only has one hand..."
At 6'4, 250, Breneman doesn't have great height for a tight end, but he runs well and you don't have to be an NFL scout to see how well he catches the football in the video above. This offseason, the Eagles could potentially lose Trey Burton to free agency and Brent Celek to retirement, making tight end a significant need. Jones is a polarizing player whose projections are all over the map. He's only a two-year starter, having taken over at left tackle after Taylor Decker was drafted. Interestingly, Jones accepted an invite to the East-West Shrine Game, the less prestigious of the two main college football all-star games, after the Senior Bowl. That may give an idea of what the NFL thinks of him. Teams tend to over-draft offensive tackles, but if I'm the Eagles, I like him as a late-round project who can grow behind Jason Peters (if he returns), Lane Johnson, and Halapoulivaati Vaitai.